I LOVE any holiday that revolves around eating, so it’s no surprise that Thanksgiving is a pretty exciting day (okay, week) around these parts. While I love getting together with family and sitting at a giant table laden with food, sometimes I want to celebrate with just me and Mike. So, this year (Thanksgiving is a bit earlier in Canada), I decided to make us a tiny Thanksgiving for two. We still went to multiple turkey dinners with family and friends, so I basically got the best of all worlds. Although, I’m not so sure my pants agree. Four turkey dinners does seem like a bit much, no? If you’re planning a small Thanksgiving for two, consider turkey legs. There was no way I was going to make a whole turkey for just the two of us so I went with a leg. They’re much harder to overcook compared to turkey breast and they’re also way more flavourful. 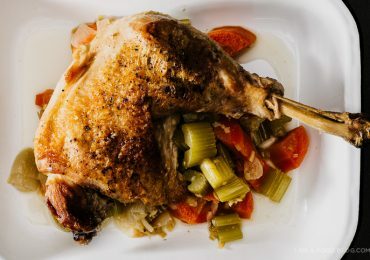 Turkey legs are perfect for braising – give them a little time and they’re moist, tender, and fall-off-the-bone delicious. Essentially this recipe is mostly hands off. Just prep a couple of vegetables, brown up your leg, then pop it in the oven for a couple of hours. That gives you time to work on your sides (I’m posting up some sides in the coming week and a bit) or snuggle up on the couch for a couple of shows on Netflix. The end result is absolutely addictive – crisp, burnished brown skin, light lemongrass flavour, juicy meat. 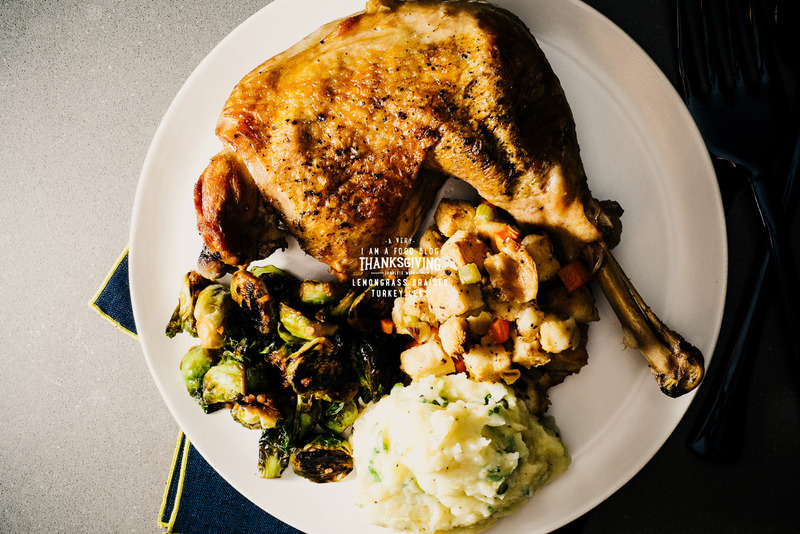 Top it all off with gravy made from the braising liquid and you’ve definitely have something to be thankful for! Pat the leg dry and season with salt and pepper. Heat the oil in an oven proof heavy bottomed pot over medium heat. Brown the leg on both sides, flipping once, 15-20 minutes, until a deep golden color. Remove and set aside on a plate. Add the onions, shallots, garlic, and minced lemongrass to the pot and cook until soft, 5-8 minutes. Add the bruised lemongrass stalk, the browned turkey, and the chicken stock. Bring to a boil then reduce the heat so the stock is barely simmering. 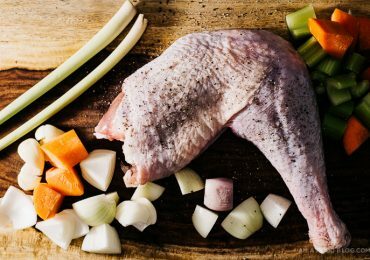 The leg should rest on the vegetables so that the skin is exposed, but the majority of the meat is submerged. Transfer to the oven and cook, covered, until the leg is fall apart tender and the sauce has reduced. The skin should be a deep brown, about 2 hours. Take the pot out of the oven and carefully transfer the turkey leg to a plate. Enjoy hot with lemongrass gravy. Make the gravy: Strain the cooking liquid from the lemongrass turkey through a fine mesh strainer into a bowl or a large liquid measuring cup. Skim the excess fat from the surface of the stock. In a large saucepan, melt the butter over medium to medium-high. Whisk in the flour and cook until golden brown and incorporated, about 2 minutes. 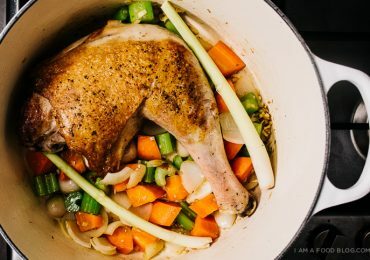 Slowly whisk in the stock from your cooked legs. Turn up the heat and bring to a gentle boil and thicken. Taste and season with salt and pepper if needed.